In the original JISC OER Rapid Innovation call one of the stipulations due to the size and durations of grants is that the main reporting process is blog-based. Amber Thomas, who is the JISC Programme Manager for this strand and a keen blogger herself, has been a long supporter of projects adopting open practices, blogging progress as they go. Brian Kelly (UKOLN) has also an interest in this area with a some posts including Beyond Blogging as an Open Practice, What About Associated Open Usage Data? For the OERRI projects the proposal discussed at the start-up meeting was that projects adopt a taxonomy of tags to indicate keys posts (e.g. project plan, aims, outputs, nutshell etc.). For the final report projects would then compile all posts with specific tags and submit as a ms-word or pdf. There are a number of advantages of this approach one of them, for people like me anyway, is it exposes machine readable data that can be used in a number of ways. In this post I’ll show I’ve create a quick dashboard in Google Spreadsheets which takes a list of blog RSS feeds and filters for specific tags/categories. Whilst demonstrated this with the OERRI projects the same technique could be used in other scenarios, such as, as a way to track student blogs. As part of this solution I’ll highlight some of the issues/affordances of different blogging platforms and introduce some future work to combine post content using a template structure. The link to the document above is the one I’ll be developing throughout the programme so feel free to bookmark the link to keep track of what the projects are doing. The way the spreadsheet is structured is the tags/categories the script uses to filter posts is in cells D2:L2 and urls are constructed from the values in columns O-Q. The basic technique being used here is building urls that look for specific posts and returning links (made pretty with some conditional formatting). So how do we build a url to look for specific posts? With this technique it comes down to whether the blogging platform supports tag/category filtering so lets first look at the platforms being used in OERRI projects. 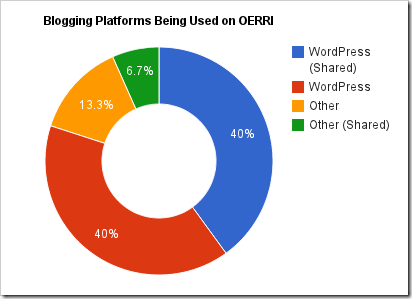 This chart (right) breaks down the blogging platforms. You’ll see the most (12 of 15) are using WordPress in two flavours, ‘shared’, indicating that the blog is also a personal or team blog containing other posts not related to OERRI and ‘dedicated’, setup entirely for the project. The 3 other platforms are 2 MEDEV blogs and the OUs project on Cloudworks. I’m not familiar with the MEDEV platform and only know a bit about cloudworks so for now I’m going to ignore these and concentrate on the WordPress blogs. One of the benefits of WordPress is you can can an RSS feed for almost everything by adding /feed/ or ?feed=rss2 to urls (other platforms also support this, I a vague recollection of doing something similar in blogger(?)). For example, if you want a feed of all my Google Apps posts you can use https://mashe.hawksey.info/category/google-apps/feed/. Even better is you can combine tags/categories with a ‘+’ operator so if you want a feed of all my Google Apps posts that are also categorised with Twitter you can use https://mashe.hawksey.info/category/google-apps+twitter/feed/. This works well but one of the drawback of importFeed is we can only have a maximum of 50 of them in one spreadsheet. With 15 projects and 9 tag/categories the maths doesn’t add up. Note this code also uses the Cache Service to improve performance and make sure I don’t go over my UrlFetch quota. We can call this function like other spreadsheet formula using ‘=fetchUrlfromRSS(aUrl)’. So we have a problem getting data from none WordPress blogs, which I’m quietly ignoring for now, the next problem is people not tagging/categorising posts correctly. For example, I can see Access to Math have 10 post including a ‘nutshell’ but none of these are tagged. From a machine side there’s not much I can do about this but at least from the dashboard I can spot something isn’t right. I’m sure once projects are politely reminded to tag posts they’ll oblige. One incentive might be to say if posts are tagged correctly then the code above could be easily added to to not just pull post links but the full post text which could then be used to generate the projects final submission. So stay tuned to the OERRI Project Post Directory spreadsheet to see if I can incorporate MEDEV and Cloudworks feeds, and also if I can create a template for final posts. Given Brian’s post on usage data mentioned at the beginning should I also be tracking post activity data on social networks or is that a false metric? After I figured out what the rather confusing comment on our blog was about, I have added some tags to the “Access to Math” blog. Let’s see if they are being picked up. Hi Volker – Posts are being picked up now, thanks. I can see the updates in the spreadsheet. What is the difference between the outputs and outputslist tag? Yes, it was a bit cryptic, just getting a link.